Komodo dragon (Adhi Rachdian/Wikipedia, CC BY 2.0). Padar Island (Anoldent/Flickr, CC BY-SA 2.0). These volcanic islands are inhabited by a population of around 5,700 giant lizards, whose appearance and aggressive behaviour have led to them being called ‘Komodo dragons’. They exist nowhere else in the world and are of great interest to scientists studying the theory of evolution. The rugged hillsides of dry savannah and pockets of thorny green vegetation contrast starkly with the brilliant white sandy beaches and the blue waters surging over coral. Komodo National Park, located in the center of the Indonesian archipelago, between the islands of Sumbawa and Flores, is composed of three major islands (Rinca, Komodo, and Padar) and numerous smaller ones, all of them of volcanic origin. Located at the juncture of two continental plates, this national park constitutes the “shatter belt” within the Wallacea Biogeographical Region, between the Australian and Sunda ecosystems. The property is identified as a global conservation priority area, comprising unparalleled terrestrial and marine ecosystems and covers a total area of 219,322 ha. The dry climate has triggered specific evolutionary adaptation within the terrestrial flora that range from open grass-woodland savanna to tropical deciduous (monsoon) forest and quasi cloud forest. The rugged hillsides and dry vegetation highly contrast with the sandy beaches and the blue coral-rich waters. The most remarkable inhabitant of Komodo National Park is the Komodo Lizard, Varanus komodoensis. These giant lizards, existing no-where else in the world, are of great scientific interest, especially for their evolutionary implications. Most commonly known as ‘Komodo Dragons’, due to its appearance and aggressive behavior, the Komodo Lizard, is the largest living species of lizard, growing to an average length of 2 to 3 meters. The species is the last representative of a relic population of large lizards that once lived across Indonesia and Australia. As well as being home to the Komodo dragon, the Park provides a refuge for many other notable terrestrial species such as the orange-footed scrub fowl, an endemic rat, and the Timor deer. The rich coral reefs of Komodo host a great diversity of species, and the strong currents of the sea attract the presence of sea turtles, whales, dolphins and dugongs. Criterion (vii): Komodo National Park is a landscape of contrasts between starkly rugged hillsides of dry savanna, pockets of thorny green vegetation, brilliant white sandy beaches and blue waters surging over coral, unquestionably one of the most dramatic landscapes in all of Indonesia. Demonstrating exceptional natural beauty that is all the more remarkable as a counterpoint to the dominant lushness of vegetation which characterizes vast areas of forested Indonesia, and with which most of the world associates the archipelago. An irregular coastline characterized by bays, beaches and inlets separated by headlands, often with sheer cliffs falling vertically into the surrounding seas which are reported to be among the most productive in the world adds to the stunning natural beauty of landscapes dominated by contrasting vegetation types, providing a patchwork of colours. Criterion (x): Komodo National Park contains the majority of the world’s areas in which wild populations of the Komodo dragon lizard still exist. The largest and heaviest of the world’s lizards, the species is widely known for its impressive size and fearsome appearance, its ability to effectively prey on large animals, and a tolerance of extremely harsh condition. The population, estimated at around 5,700 individuals is distributed across the islands of Komodo, Rinca, Gili Motong and some coastal regions of western and northern Flores. Other fauna recorded in the park are characteristic of the Wallacean zoogeographic region with seven species of terrestrial mammal, including an endemic rat (Rattus rintjanus) and the crab-eating macaque (Macaca fascicularis) and 72 species of birds, such as the lesser sulphur-crested cockatoo (Cacatua sulphurea), the orange-footed scrub fowl (Megapodius reinwardt), and noisy friarbird (Philemon buceroides). The coral reefs fringing the coast of Komodo are diverse and luxuriant due to the clear water, intense sunlight and rapid exchange of nutrient-rich water from deeper areas of the archipelago. The marine fauna and flora are generally the same as that found throughout the Indo Pacific area, though species richness is very high, notable marine mammals include blue whale (Balaenoptera musculus) and sperm whale (Physeter catodon) as well as 10 species of dolphin, dugong (Dugong dugon) and five species of sea turtles. Labuan Bajo. Once a small fishing village, Labuan Bajo (also spelled Labuhanbajo and Labuanbajo) in Flores is now bustling with tourists. 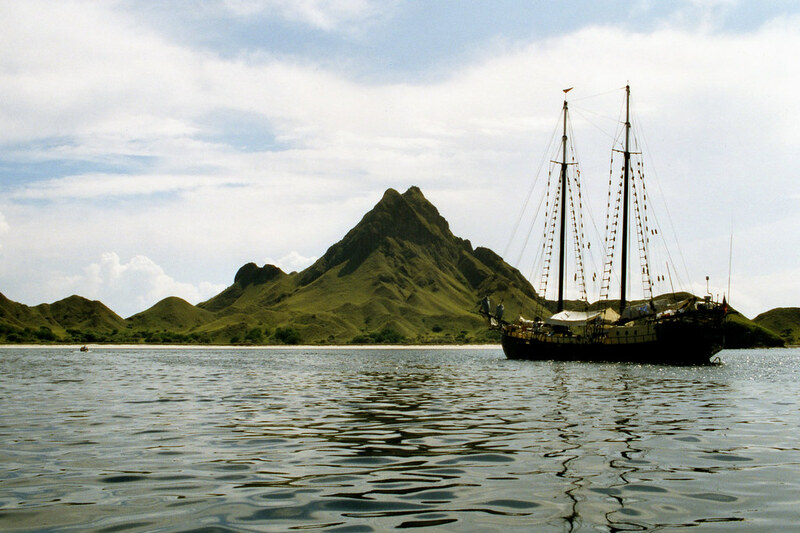 Labuan Bajo is the launching point for trips to Komodo Island and Rinca Island, home to the famous Komodo dragons. While Labuan Bajo draws plenty of tourists, it is nevertheless quite a small town that runs along one main road, making it easy to navigate. Nearby Seraya Island is a great opportunity to do some diving and snorkeling and every evening at Kalong Island thousands of flying fox bats put on an amazing display [read more]. Bima (Indonesia: Kota Bima) is a city on the eastern coast of the island of Sumbawa in central Indonesia’s province West Nusa Tenggara. It is the largest city on the island of Sumbawa, with a population of 142,443 at the 2010 Census, but the latest official estimate (as at January 2014) is 148,984. It is separate from (but surrounded by) the adjoining Regency of Bima which had a population of 407,636 at the 2010 Census. The people of Bima and the entire eastern side of Sumbawa speak what is known as Bima language [read more]. Waingapu is the largest town of the island of Sumba in the Nusa Tenggara region of Indonesia. Waignapu is the gateway town to Sumba and many visitors arrive here. Waignapu’s Mau Hau airport (WGP IATA) is a small single runway regional airport served by a few regional arilines. The main airlines are Wings Air (a subsidiary of Lion Air) and Nam Air (a subsidiary of Sriwijaya), with both offering flights from Denpasar (Bali) and the provincial capital Kupang. Susi Air operates routes to smaller airports on nearby islands, including various airports on Flores [read more]. We have been lucky enough to snorkel and dive in some wonderful spots on this beautiful planet of ours but nothing compares to exploring what lives below the surface in Komodo National Park. The crystal clear waters and the vibrant coral reefs were enough to have us wanting to come back for more and that was before we lost count of the amount of turtles, manta rays and sharks that we encountered each and every time we put our head under the water. It was truly memorable in a way that is hard to explain and we were of course humbled by what we experienced, all we can say is that we cannot imagine any other under water adventures that we have in the future even coming close to our time in Komodo. The diving is brilliant and the opportunities for underwater photography are endless. What makes Komodo such a special destination is the variety of dive sites and marine life. There’s pinnacles and seamounts; healthy hard coral reefs; exhilarating drift dives; world-class manta ray dives; excellent muck dives; big fish, small fish; all found in warm water and cold water with good visibility and sometimes not so good visibility! Just about every sought after critter can be seen in Komodo, including some very rare ones. Leopard anemone shrimps, dragon shrimps, paddle-flap and weedy Rhinopias to name a few. See the bright and colorful sea apples in the south of the park, alongside the tiny ladybugs whom cover the soft corals, feather stars and ascidians. In the north dive in the aquariums of Castle and Crystal Rock where the schooling fish zoom around the dive sites chased by giant trevallies, sharks and napoleon wrasses. We both love diving in Komodo. Having spent the last 10 high seasons there we know it so well and going back each year is like seeing a good friend again. Spotting dragons in Komodo National Park takes place on neighbouring Rinca Island – not Komodo – as this is the best place to spot these enormous reptiles. It’s here you can walk through the local village past rickety houses that are built high up on stilts above the island floor. You’ll be guided by a park ranger as you wander into the wilderness to come face-to-face with these endearing beasts. Pack your camera, and always stay close to your guide! With such undeniable good looks it’s hard to believe that the island’s most infamous inhabitants, the Komodo dragons, are aggressive carnivores capable of hunting down wild boar, water buffalo and deer, all of which roam freely in the park. Searching for these prehistoric-looking reptiles in their natural habitat, we are accompanied by park guides with two pronged sticks — understandably, tourists are only allowed on the island when part of an arranged tour. We are rewarded with sightings of six large males at a watering hole, who thankfully seemed more interested in napping than snacking.